Chinese Premier Li Keqiang pledged to increase aid for Africa at the World Economic Forum in Nigeria on Thursday. China, Li vowed, will earmark more than half of its foreign aid for Africa “without preconditions”. 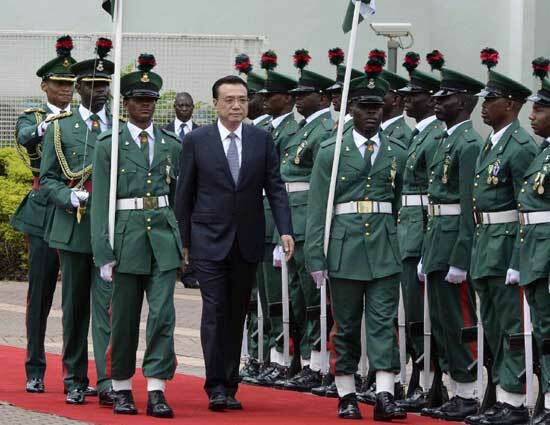 “China will, as always, continue to increase its assistance to Africa in both quantity and quality to the extent of its ability, ensuring that more than half of its foreign aid will go to Africa,” Li told the World Economic Forum on Africa which opened in the Nigerian capital on Thursday. “China will never use its aid to interfere in the internal affairs of African countries,” he added. During his maiden Africa trip, Li said China will aid African infrastructure building including, high-speed railway, expressway and aviation networks. Over a thousand representatives including heads of state, business leaders and officials gathered at Abuja for the World Economic Forum meet. Africa is projected to grow above 5 per cent in 2014. The continent, with one billion people and over $2 trillion in combined GDP, saw its economy growing by more than five per cent annually over the past ten years. Of all the ten most rapidly developing economies in the world, six came from Africa. China, the continent’s largest trading partner has signed a slew of agreements with Ethiopia and Nigeria during the Chinese Premier’s Africa trip. At the WEF meet on Africa, Li told the assembled world leaders that China enjoys a solid foundation of sustained economic growth despite a recent slowdown. “We have the confidence and capability to meet the expected growth target of around 7.5 per cent for this year,” he said in a keynote speech. “Since entering the new century, the strong growth in China has generated more exports from Africa and given strong support to Africa’s rapid growth. Africa has the practical need for infrastructural and industrial development, whereas China has surplus capacity in investment, construction, and production in this regard. Our economies are highly complementary, and by conducting mutually-beneficial cooperation and drawing upon each other’s strength, we will definitely inject greater momentum into our economic and social development,” he added. Beijing has been trying to rein in debt and pollution while avoiding a sharper economic slowdown.